Here's an interesting new book by Bob Harris, author of Prisoner of Trebekistan. 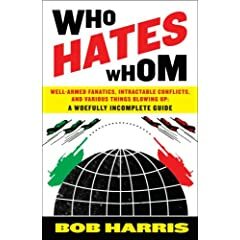 Billed as "a brief, pocket-sized paperback guide to about 35 of the world’s major conflict zones, complete with original maps, illustrations, and photographs," it's called Who Hates Whom. The subtitle is, "Well-Armed Fanatics, Intractable Conflicts, and Various Things Blowing Up - A Woefully Incomplete Guide". On his blog, Harris gives an illustration of why he wrote the book, in light of the 100,000-strong peaceful protest march in Burma, and its subsequent deafening silence in the U.S. media. Out of curiosity, tonight I taped an hour each of two of CNN's signature shows -- the "Situation Room" (where the main situation usually seems to be Wolf Blitzer needing to speak in headlines! every third word!) and "Prime News with Erica Hill" on CNN's Headline News channel. So just how much airtime did an unprecedented march against one of the world's most despicable governments get? Prime News with Erica Hill: zero minutes and zero seconds. To anyone mistakenly relying on this program, the vast protest in Burma simply didn't happen. Although there was time to mention Mike Tyson's latest arrest, possible criminal charges against Britney Spears, a tapestry in Florida that kinda looks like the Virgin Mary, and -- I kid you not -- an extended discussion entitled "Does God Watch Sports?" Speaks for itself. Who Hates Whom exists because today's pattern was no exception. It'll be repeated elsewhere tomorrow, and the next day, and the next. The sad reality: TV news shows generally are not there to deliver you information that you can use -- they exist to deliver you... to the advertisers. You're the product being bought and sold. And the most efficient way to do that is to inflame, to excite, to bring back recurring characters (Donald Trump, coming up next! ), good guys and bad guys. It's a news show, involving actual news, to about the same extent that Cheez Whiz involves actual cheese.